I've been trying really hard to focus on my word of 'believe'. When I start to doubt something, I think about my word. I actually got myself a bracelet and a ring that are physical reminders. I just have to look down at my wrist or finger and see it. 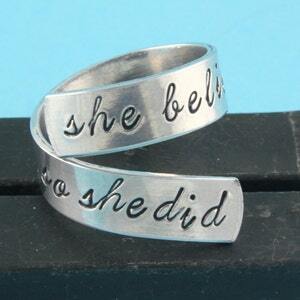 The ring has a quote on the outside. 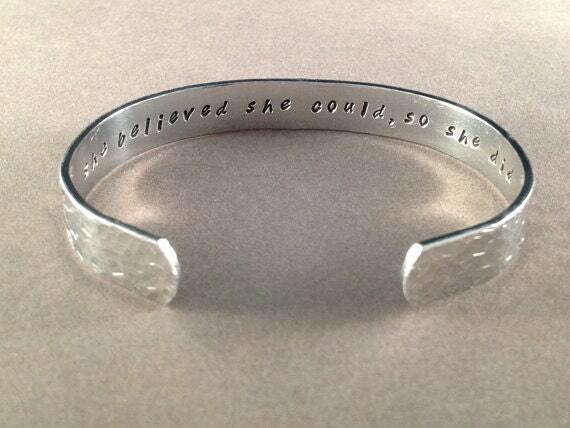 The bracelet has a quote on the inside, so it just looks like a silver bracelet, but I know what's on the inside. I really love that quote and that's my main quote for believe. So I got it on the bracelet too. I love both of those! I need that reminder often too. Those are lovely pieces! We all need a little reminder and what a powerful word you have chosen. Best of luck and thank you for all your great ideas!